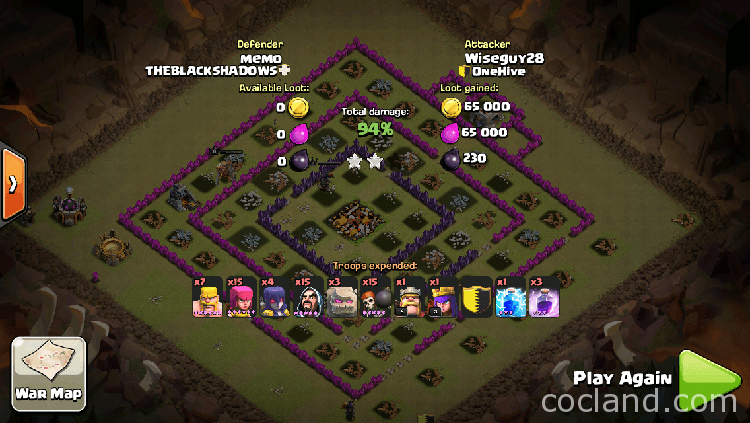 GoWiWi Attack Strategy is not a new strategy in Clash of Clans but people just know about it these days. In this GoWiWi advanced guide, I will give all things for you to be successful with it. GoWiWi is one of the most powerful troop composition in Clash of Clans with the core troops are Golems, Wiches and Wizards. 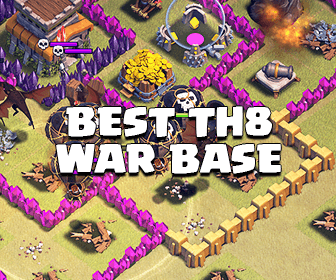 With this strategy, you can always get 2 stars on every base. Troops: 3 Golems, 4 Wiches, 10-15 Wizards, 5-7 Barbarians, 10-15 Archers and 12-22 Wall Breakers. 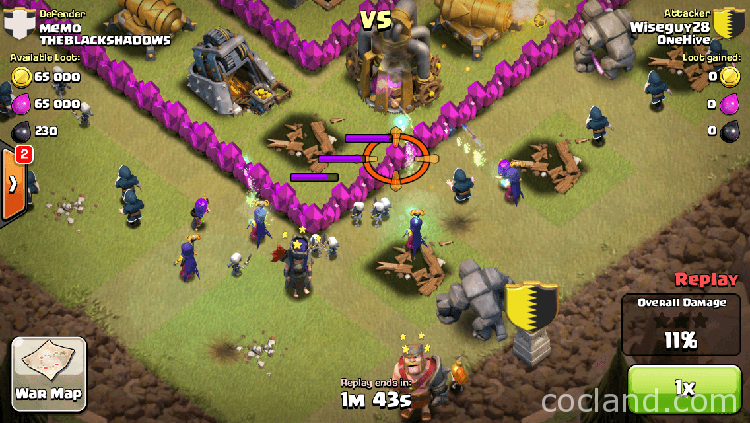 Clan troops: Golem or all Wizards. Spells: You can choose the best spells for you because all raids are obviously different. This strategy works fine with all spells so you don’t worry about it. Make your own style! When I was at Town Hall 9, I always used 1 Lightning and 3 Rage Spells. And now, when I am at Town Hall 10, 1 Lightning + 2 Rage + 2 Freeze is the best combo for me because we have to deal with the Infernos. You can change the number for the best effective with the base you want to attack. Barbarians and Archers are used for luring the Clan troops. Wall Breakers are one of the most important troops for all ground attack strategy, they give you the best time to reach into the core. 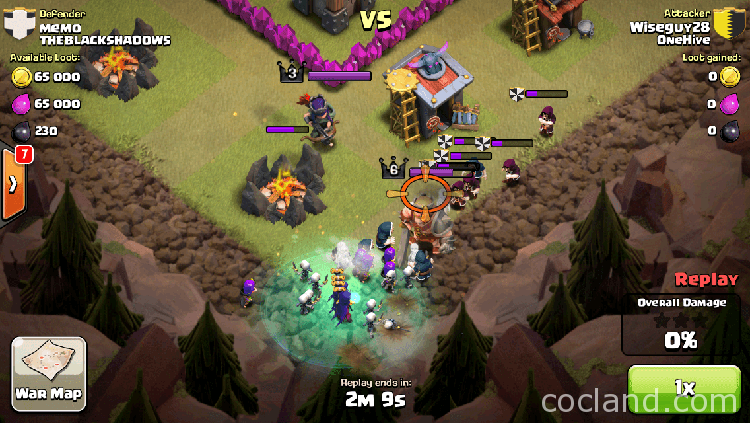 Lightning Spell is used for clearing the Clan troops. Rage Spells can help you reach into the core as quick as you can! How to choose bases for attacking with GoWiWi? 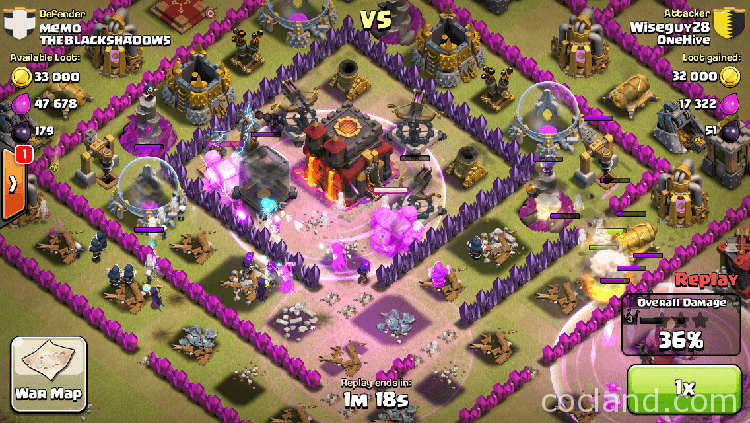 Let’s assume that you are attacking with Hogs, so you need to find compact bases. GoWiWi is the contradictory attack strategy with Hogs, you need to find spread out villages. Your Golems and Skeletons will not breathe if they don’t have spaces. If you are ready to use GoWiWi, you are obviously an elite player. You have known all should and shouldn’t do things while attacking. Firstly, Always lure the clan troops and Heroes if you can. Next, choose the side which has at least a Hero to attack. 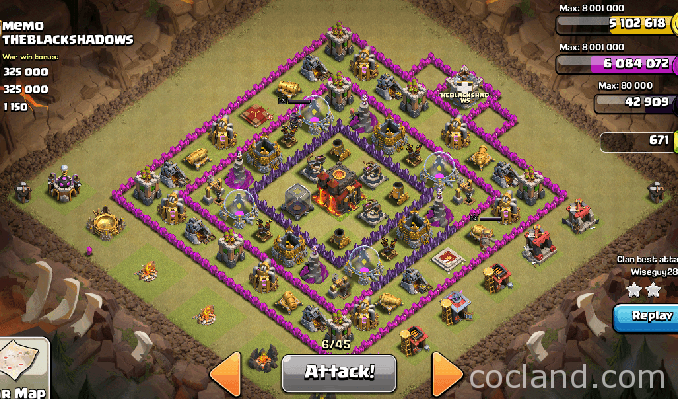 You may want to attack from the bottom because you can control and see your troops easier from there. Drop some Barbarians and Archers as the meat shield first, then deploy your Witches from the corner. Deploy some Wizards to wipe the Heroes out. Bring your Golems into the war. Deploy one Golem at a time on the left or right side. 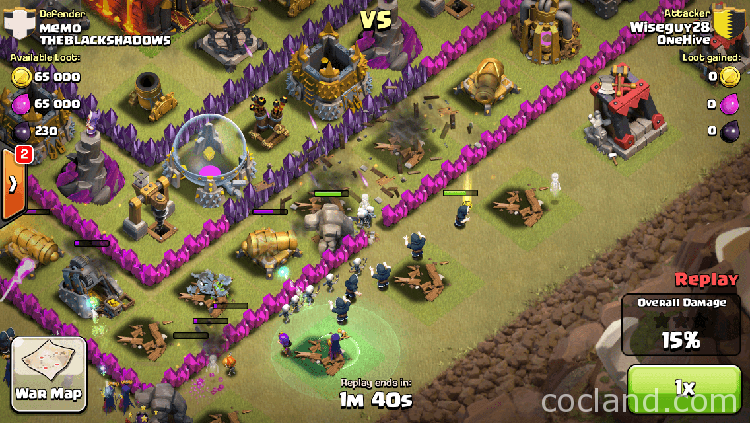 Bring 2-3 Wall Breakers into the war right after your Golem, don’t forget the Mortars, drop your WBs wisely or they can be killed by the Mortars. After your Wall Breakers, drop 6-7 Wizards. Just repeat these steps for the opposite side. All outer buildings can be removed quickly. Once you have a clear path, drop your Witches, Wizards and your Heroes. Don’t forget to use the Wall Breakers so your troops can reach the core very quick. 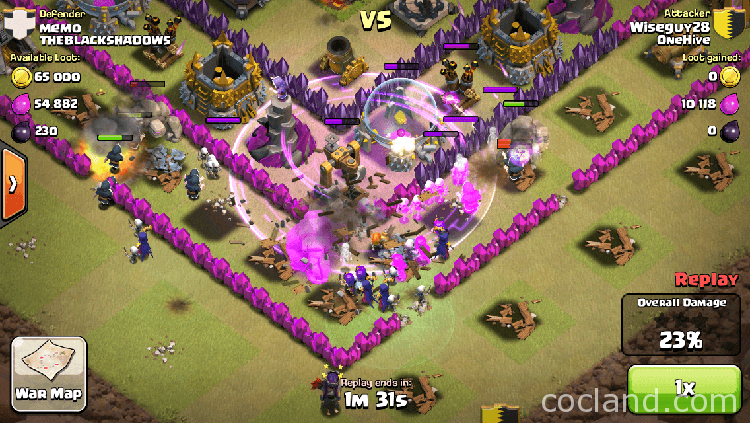 Drop your last Golems when the defense buildings start attacking your Witches. When your Golems are inside, drop the Rage Spell and the rest of your Wall Breakers. Once you reach the core, drop the another Rage Spell for boosting the speed of your troops. Use Freeze Spell If there are Infernos there. 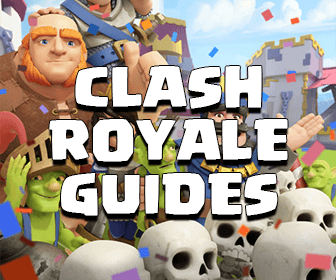 If you have any questions or ideas, please do a comment and help me improve the guide! This one was based on the GoWiWi attack strategy from Wiseguy28.